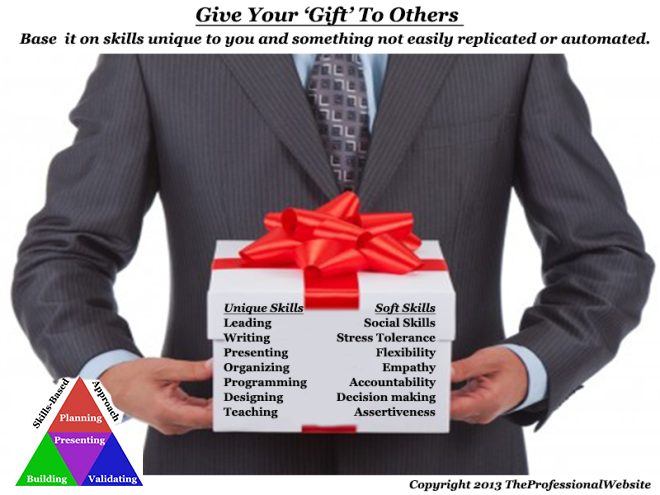 In a couple of his books (Linchpin and The Icarus Deception), Seth Godin discusses a concept of ‘gift giving’. He suggests that we use our talents to create art, which we then give to others as a gift. The gift is valuable because we create it with our best talents. For example, if you are a writer, your gift is a book or article you wrote. The internet makes it easy to give gifts. There are free web services (such as blogging platforms and social media) you can use to give a gift. What I like about Seth’s ‘gift economy’ is it incentivizes us to create art, especially when we are not directly compensated. I think of my blogging as a gift in this way. I share it with you and you read it for free. The best way you respond to my gift is by writing a comment, liking it, and/or sharing it in social media. I have copyright privilege to the content, but the dissemination of my ideas is not protected. I also like the idea of creating art based on our core competencies and values. Utilize your unique skill set and soft skills to create something that is not easily replicable or automated. I think a problem with Seth’s ‘gift economy’ is a professional (an artist) can be taken advantage of and never get properly compensated. In Linchpin, Seth argues that it is a matter of professionals getting recognized for their talent and then having leaders pay them properly. Problem is that it takes time to build a reputation. Perhaps a professional’s best work is their earlier works or he or she only creates one masterpiece and never has the insight to do it again.